The Tate Modern, the world-famous modern art gallery located in London, is hosting Polish artist Mirosław Balka’s installation titled “How It Is”. On view from 13 October until 5 April 2010, the project is part of the Tate’s Unilever Series. 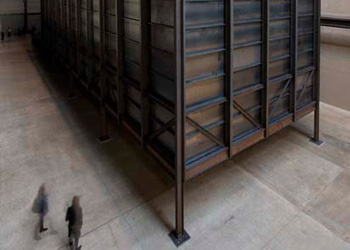 The installation consists of a giant steel structure, which encompasses a dark area is open for visitors and is the main part of the exhibition. The Polish artist, born in 1958 in Warsaw, is mostly known for works that draw on his Catholic upbringing and the complicated history of Poland, tying his personal history with the history of his country. Balka himself will be present at the Tate on Tuesday, 20 October, when he will talk to art historian and critic Paulo Herkenhoff about his installation.